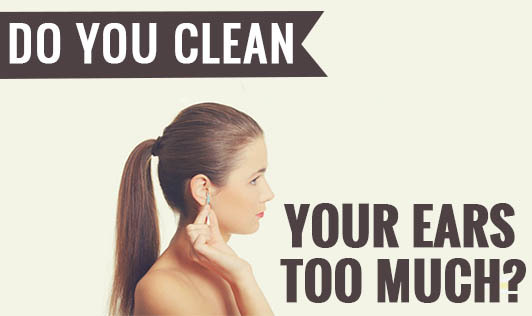 Do You Clean Your Ears Too Much? How often do you clean your ears? Do you clean it with ear buds or sticks or with your finger? What is the right way to clean your ears and how often should you do it? Cleaning ears seem like such a simple and unimportant task. We normally do it without giving any thought to how we're doing it, whether the cleaning aid we're using is good or bad for our ears etc. Ear wax or cerumen is produced to protect the ears and its canal from dust, bacteria and other potential substances which can enter the ear canal and damage the ear drums. Excessive production of ear wax can cause discomfort, hearing impairment, itching, and in severe cases, may cause dizziness and ear pain. Cleaning your ears too much or too often, especially with ear buds, is found to be harmful to the ears. Ear buds tend to push wax further into the ear canal, towards the ear drum which is not good. In most cases of ear wax blockage, you will be surprised to know that the use of ear buds is the cause. These buds rub against the tissues in the ears and damage them, which could cause deafness if done repeatedly. Since the tissues in the ears are very delicate, the uses of any sharp or thin objects which can reach the ear drums are bad! If you're not allowed to use ear buds, how else can you clean your ears? If the wax is soft and there are no complications, you can just clean your ears with a towel after bath every day. This prevents accumulation and crusting of ear wax. If there is an accumulation or crusting of ear wax, it is better to meet a doctor to get it removed. Do not attempt to remove it yourself by using buds, sticks or any such objects. As the famous saying goes, prevention is always better than cure, take care of your ears every day and avoid the complications!